London Fashion Week may only be four days, but its impact is lasting. With the London SS17 fashion week behind us, industry experts across the globe stay tuned in to spill the beans on all those unmissable trends. The verdict is in…. from stripes over florals – to bright colours over pastels, we’re getting ready to make that spring 2017 wardrobe shift. In order to stay afloat, you can’t afford to overlook any detail, we certainly won’t be. This Spring it’s not just about what the models are wearing, but also what’s on their heads. Yes, hats and accessories are important too, but we’re talking hair. Whether you want to remain on your A game, or just need a little hairspiration, we’ve got you covered. Here’s our Top 5 London Fashion Week Hair Trends for Spring 2017. The crimped look- an oldie, but a goodie. 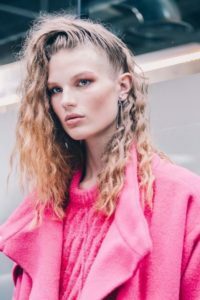 Topshop’s SS17 crimped styling, provides a different dimension to the typical middle parting we’re all so used to. The new sweep over reinvention has taken this absolute classic to new heights. 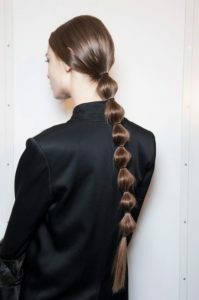 The neatly put together French plait has had its day, and now, in its place, we have the fun and quirky bubble braid. It requires a sleek texture, which can be achieved through professional hair straightening; a real eyecatcher that can be dressed up or down. There’s been an increase in blurred gender lines in modern day society and this is no exception in the fashion world. 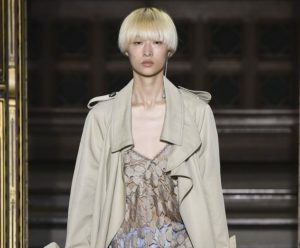 Sharon Wauchob’s SS17 models sported all the rage boyish crops, and brought all things feminine with it. One for the rebels perhaps? Holiday season may be over but the beach wave look certainly isn’t. Julien Macdonald’s SS17 models have been serving looks with this hair. Get the wave effect, and relive last summer daily. 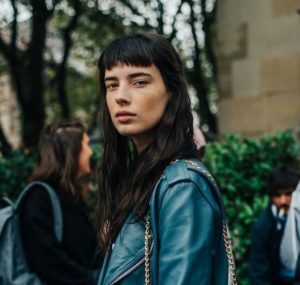 Short bangs were a big favourite throughout LFW; from attendees to runway. Models from the Emilio de la Morena show were seen rocking this blunt edged fringe. A look perfect for those with heart shaped faces looking to let those cheekbones pop. When we said we had you covered for this Spring, we really did mean it. No need to sit and go through the who’s, what’s and how’s of achieving these looks. Why not check out the latest hair treatment offers available at Book Your Lifestyle today? Whether you need voluminous curls or an edgy short cut, it’s a job for our trusted partner salons; always on hand to keep you runway ready.